Charlie Brooker (Author) Charlie Brooker is an award-winning writer, producer and broadcaster whose career has spanned television, radio, print, and online media. Brooker is the creator and writer of Black Mirror, whose fourth season launched on Netflix at the end of 2017 and won a BAFTA Craft Award and has recently picked up three BAFTA TV Awards nominations. The critically acclaimed, mind-bending anthology series originally launched on Channel 4 in 2011 and over its four seasons has collected awards including Primetime Emmys (R) for Outstanding TV Movie and Outstanding Writing for a TV Movie, Producers Guild of America, Rose D'or, BAFTA, International Emmy (R) and Peabody. Charlie has presented numerous television shows including three series of his BBC Two satirical review show Weekly Wipe, the third series of which was nominated for the 2015 BAFTA for Best Comedy and Comedy Entertainment Programme, and the annual shindig Charlie Brooker's End of Year Wipe, which won a BAFTA for its 2016 edition. Also, Charlie previously presented the BAFTA-nominated Election Wipe, Gameswipe and Newswipe, which won the 2009 Royal Television Society Award for Best Entertainment Programme and the How TV Ruined Your Life series for BBC TWO. He has also presented You Have Been Watching and 10 O'Clock Live for Channel 4, which he was also BAFTA-nominated for in 2014. Charlie is also behind the BBC Two series Cunk on Britain and the BAFTA-nominated Cunk on Shakespeare with regular Weekly Wipe contributor Philomena Cunk. He also co-wrote the critically acclaimed detective spoof A Touch of Cloth for Sky One. The TV film trilogy starred John Hannah and Suranne Jones and won the Broadcast Award for Best Comedy and was nominated for the RTS Award for Best Comedy. In 2008 Brooker wrote the five-part thriller Dead Set, which starred Jaime Winstone and Riz Ahmed and was nominated for a Best Drama Serial BAFTA; and co-wrote with Chris Morris the six-part comedy series Nathan Barley for Channel 4. Annabel Jones (Author) Annabel Jones is a long-term collaborator of Charlie Brooker's. She serves as co-show runner and executive producer on Black Mirror, which Brooker created and writes. In addition to its recent BAFTA TV nominations and BAFTA Craft win, over its four seasons Black Mirror has garnered awards at the Primetime Emmys (R) for Outstanding TV Movie and Outstanding Writing for a TV Movie, Producers Guild of America, Rose D'or, BAFTA, International Emmy (R) and Peabody. Previously Jones executive produced a number of shows presented by Charlie Brooker including three series of the BAFTA-nominated BBC Two satirical review Weekly Wipe; all seven editions of the annual shindig Charlie Brooker's End of Year Wipe, which won a BAFTA for its 2016 edition; How Video Games Changed the World; Newswipe, which won the 2009 Royal Television Society Award for Best Entertainment Programme; Gameswipe; and the How TV Ruined Your Life series for BBC Two. In 2016 Jones was executive producer of the BAFTA-nominated Cunk on Shakespeare and festive special Cunk on Christmas with regular Weekly Wipe contributor Philomena Cunk. Between 2012-2014 Jones executive produced the acclaimed detective spoof trilogy A Touch of Cloth for Sky One, starring John Hannah and Suranne Jones, which won the Broadcast Award for Best Comedy and was nominated at the RTS Awards for Best Comedy. In 2008 Jones executive produced the five-part thriller Dead Set, which starred Jaime Winstone and Riz Ahmed and was nominated for a Best Drama Serial BAFTA. Recently, Jones served as executive producer of the BBC Two series Cunk on Britain. Jason Arnopp (Co-author) Jason Arnopp is a novelist and scriptwriter, with a background in journalism for such titles as Heat, Q, Kerrang!, SFX and Doctor Who Magazine. He wrote the terrifying 2016 Orbit Books novel The Last Days Of Jack Sparks, acclaimed by the likes of Ron Howard, Sarah Lotz and Alan Moore. Arnopp's previous works include official Doctor Who and Friday The 13th tie-in fiction, Beast in the Basement: A Sincere Warning About the Entity in Your Home and the non-fiction title How To Interview Doctor Who, Ozzy Osbourne and Everyone Else. He lives in Brighton, UK, and can be found on Twitter as @jasonarnopp. I loved this book and sped right through it. 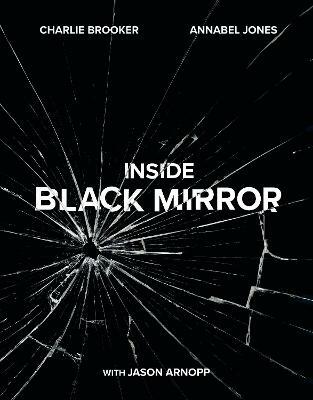 It gave fascinating behind the scenes info on each Black Mirror episode and was a fun read in general. I recommend it to any Black Mirror fans.